The Salt Building is an iconic historical landmark in the new Southeast False Creek neighbourhood, which is home to the Olympic Athletes’ Village. It is located on First Avenue and Manitoba Street, at the former shoreline of False Creek. 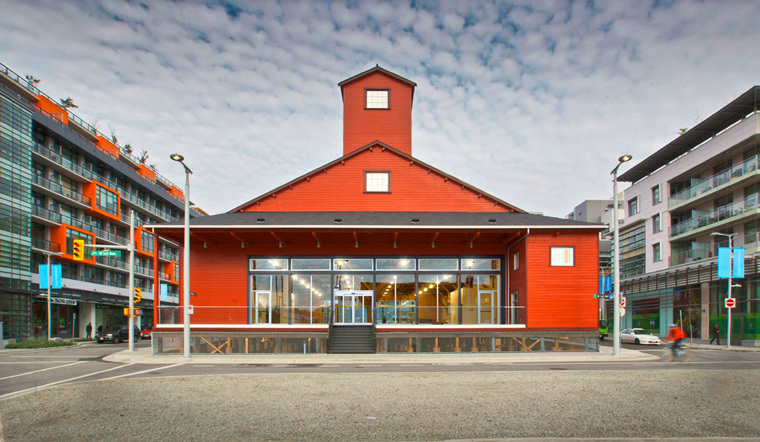 Built in the 1930s when the shoreline bristled with ship builders, steel fabricators and sawmills, the Salt Building embodies the legacy of the rich industrial past of this neighbourhood. Originally, the building was used as a refinery of salt, which was shipped from San Francisco. The north end of the building retains a small dock-like structure where the salt was loaded and unloaded. As railway transportation gradually replaced shipping, the building reoriented to the south and was later converted to a paper recycling plant. 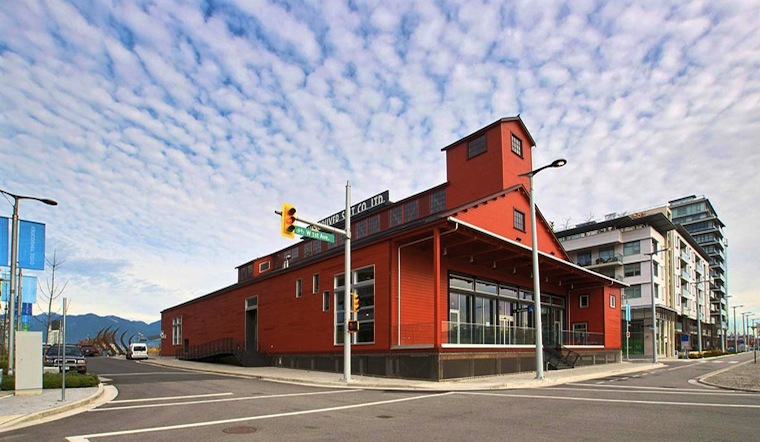 It is now owned by the City of Vancouver, and in 2013 a new coffee shop and brewpub will make the historic Salt Building an important gathering place for the local community. 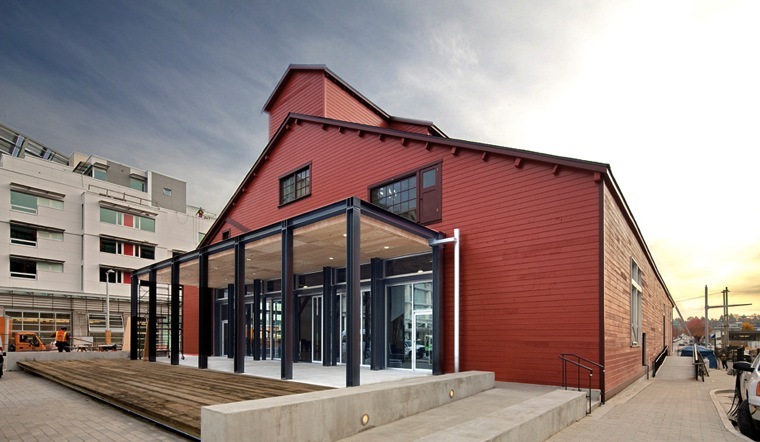 The rehabilitation of the Salt Building, initiated in 2007, presented a rare opportunity to integrate the concepts of adaptive reuse and heritage conservation, in the context of sustainable practices, as identified by the LEED Core and Shell (LEED-CS) system. As a result, the Salt Building is one of very few heritage projects to achieve Gold certification under LEED–CS in Canada. The rehabilitation included shell restoration and raising the building on piling extensions to align with the new street level. This also served to highlight the original exposed timber piles on which the building rests, providing a sense of layered history of the site. Its large, open interior, supported by elaborate roof trusses, creates a unique amenity for the community. 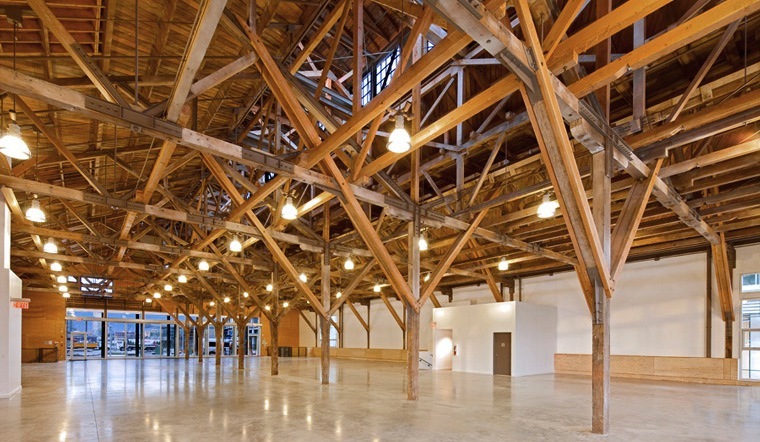 The Salt Building meets LEED-CS Gold requirements by utilizing natural ventilation and lighting, a Neighbourhood Energy Utility, and the reuse of materials. LEED credit interpretation, LEED documentation review and certification package submission.